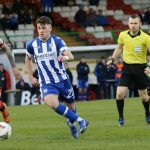 First-half strikes from Ian Parkhill and Stephen Lowry had the Bannsiders well on their way, before Eoin Bradley pounced on a goalkeeping error to add a decisive third after the break. The result was a welcome three points for the Stripes as boss Oran Kearney was without TEN first-team players for the fixture. “The whole time I’ve been at the club I don’t remember a day like today in relation to the amount of players we had missing,” Kearney said. 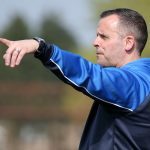 “We have 20 professional players at the club, Lyndon Kane is out long term injured, James McLaughlin is coming back from a long-term injury, we have two goalkeepers – which takes us down to 16 players, and out of that we had about eight players missing. “It was a crazy scenario to find ourselves in. “I have to give great credit to everyone today. The two young lads – Ben and Alexander – dug in and put in good performances. “Alex’s energy and enthusiasm was brilliant throughout, he was a real outlet for us. “But those guys don’t get that platform unless your senior guys are on it. “It was one of those days when we needed all those guys to have a bit of adrenaline, and stand up and give the young players the platform to do that. “Then you have Chris Johns behind that to pull off several good saves when called upon. “The third goal when their keeper missed the ball came at a great time to kill the game off. “It was everything I wanted it to be today on top of the clean sheet. It’s great to be up and running and free up those four players from suspension. The long list of absentees meant that teenage quartet Ben Moore, Alex Gawne, Caolan Brennan and Andrew Whiteside were handed their league debuts – much to Kearney’s satisfaction. “The SuperCup hurt us a bit too because I knew I was going to have to do this at this stage of the season, I knew we would need a couple of players to come in for this first game,” Kearney added. “Obviously I would never step on the County team’s toes to get the players to come and train with us. “So the earliest we come get them was last week when we played a few of them. “It probably wasn’t ideal after playing five days of football to go and play a sixth on the Saturday. 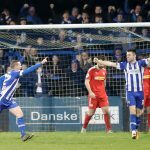 Kearney admitted he wasn’t looking for a fantastic performance from his players but that they pocketed three points ahead of next weekend’s fixture away to Cliftonville. “I said it to the coaching panel that we were purely outcome based today,” Kearney concluded. Graham Crown was also handed his first-team debut in the heart of the defence and the summer signing admits he tired in the closing stages after having only arrived in Dublin at 5:30am yesterday morning. “The main thing today was to get the three points, obviously with so many out suspended or injured, we wanted to get the win in the bag and get a good start to the season,” he continued. “I was away on holiday to America for the last four weeks and I got back in Dublin yesterday morning at 5:30am, stayed at my brothers house for a couple of hours sleep, but it wasn’t as bad as I thought, although I did tire in the last 20 minutes. “It was important that I kept myself fit over there and was ready if I was needed. I had an idea that I’d be playing, so it was all about doing some work over there. “It’s brilliant to be part of the squad and I was delighted to sign in June, especially after the season they just had. “I was joining a club that had just won the Irish Cup, pushed Crusaders hard in the League and I want to be a part of that moving forward.